You made it! You understand Twitter, you’ve signed up, tweeted and set up your Twitter management system. In the last of our week-long series, it’s time to make magic happen and talk with strangers. That sounded much better in my head. There are two ways to talk to a particular person or entity. One is doing it publicly – for all to see on Twitter. It’s called a ‘reply’ and looks like this “@carknow Thanks for reading my blog, see you soon!”. The other way is private, called a Direct Message or DM. You can DM (or reply) by clicking the appropriate button on their tweet (in hootsuite) or in their profile (the info box about them that pops up when you click on their name in hootsuite). In your tweeting bar in Hootsuite, DMs will start with a lowercase ‘d’. (Note: you can tweet via text but the commands may be different, be careful.) Hootsuite also has a ‘reply all’ feature in the drop down of their tweet so you can reply all to several people if more than one are included in a conversation. In college I had the great opportunity to spend some time in Ghana, Africa. In Ghanian culture, you don’t cross your legs (because it blocks the traditional good spirits from flowing) and you don’t use your left hand to shake hands or pass food (because in rural villages you wipe with that hand – yes, just what you’re thinking). Breaking these cultural norms offend people, make you look stupid and ruin your chances of a healthy relationship with the locals. Same goes for Twitterville. The best suggestion I have is to remember our cocktail party analogy from day 1. You’re walking into a room with millions of people. You have no idea who’s watching, no idea who you’ll meet and no idea what you’re doing there (though you’ve got a good start). So, don’t be rude, over-share, brag, interrupt, beg, curse, etc. Do – be honest, open, genuine, fun, funny, make connections, offer wisdom, spread good karma, compliment, make introductions, remember no one’s an expert and be responsive. You’ll quickly learn that many people don’t follow the rules/norms above. Like it or not, you have a personal brand and you can either keep that in mind and work to improve/protect it, or not. For more on branding yourself, check this out. Your network is measured by quality, not quantity. However, there are some things you can do to increase the likeliness that your tweets are seen and increase both the size and quality of your network. 1. Participate in twitter chats. It’s when 10-100 people set a day/time to discuss a particular topic. For a HUGE list of over 500 chats, check out this Twitter Chat Calendar and do a search for keywords or topics of interest. For mentions or retweets (RTs). Not only are they paying attention to you, but they’re doing it publicly and some of their followers may start following you. 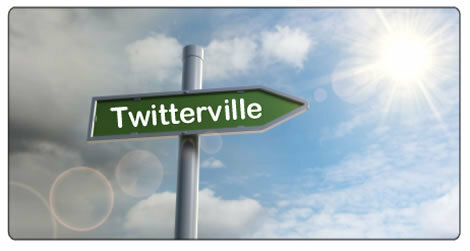 ‘Follow Friday’ is a Twitterville cultural norm that happens mostly on Fridays. You’ll see hashtags #followfriday or #FF and it’s basically a public endorsement of a handle or group of handles. There are two ways to do it. You can either list a bunch of people that you suggest others follow. Or, you can list one person and share why people should follow them and/or what topics they’re knowledgeable of. 4. Pay it forward. Give Klout. Klout is exactly what it sounds like. It’s a measure of someone’s online influence. In reality, a company started measuring it, Twitter now includes it in your profile. It’s based on some super-top-secret algorithm of followers, retweets, regularity, etc. You can go to Klout’s website to learn more BUT you can actually give Klout to other people (also via their site). Spend some time paying it forward and ‘giving’ influence points to someone who’s helped you, educated you, connected you, informed you, etc. Like karma, it’ll come back in its own way. There you have it – it you made it this far through the series, you should be off to a great start! Tweet away and have a ball. Keep me posted on your progress and share what you learned. We’re all here to learn from each other. Great series, Nate. From working in the nonprofit sector I have seen many nonprofits struggle with how to integrate twitter into their communication channels. And for those of us regular tweeters, It is always good to have a refresher. Thanks for sharing your insights. Okay, I had a twitter account before and since I didn’t know that much about its community, I just used it to post social questions…. Do nonprofit directors and such use this? Every time I try to imagine my clients and colleagues online, I think they are still figuring out e-mail.